Loose wet avalanche danger will rise to MODERATE today at all elevations as solar aspects warm from intense sun and warmer air temperatures. Isolated stubborn wind slabs may linger at upper elevations in extreme terrain. MODERATE avalanche danger remains at upper elevations today due to the continued possibility of wind slab avalanches. While LOW danger resides at mid and lower elevations it will not be impossible to find isolated pockets of unstable snow. NE winds increased last night over ridge-tops, and will continue at moderate speeds thru today. MODERATE avalanche danger exists at upper elevations on southerly to westerly facing slopes due to the possibility of triggering a fresh wind slab. The avalanche danger is MODERATE at Upper elevations and LOW at Middle and Lower elevations. Southerly winds transporting recent storm snow will produce WIND SLAB on leeward Northerly-Easterly aspects. Be particularly aware in steep and confined terrain. MODERATE avalanche danger exists today due to wind slabs at upper elevations and sunshine leading to loose wet avalanches at all elevations. Evaluate snow and terrain carefully. As 1-1.5ft of new snow accumulates throughout the day with moderate S to SW winds, avalanche danger will quickly rise to HIGH at mid to upper elevations and CONSIDERABLE at lower elevations due to wind slabs and storm slabs. Natural and human triggered avalanches will be likely. The avalanche danger is CONSIDERABLE at Upper elevations today. MODERATE avalanche danger resides at mid elevations and lower elevations. SW winds with plenty of snow available to transport will continue to develop fresh WIND SLAB. The avalanche danger is CONSIDERABLE at Upper elevations today. MODERATE avalanche danger exists at Middle and Lower elevations. SW winds with new snow accumulations (1-5") will make for increasing danger throughout the day. WIND SLAB is of most concern today. Moderate Avalanche danger remains today at all elevations. Extreme southwest winds coupled with new snow will lead to increasing avalanche hazard. Evaluate terrain carefully and monitor the weather closely today. Expect avalanche danger to rise quickly as the storm intensifies tonight. Avalanche Danger will be LOW today at all elevations. It will still be possible to find small sensitive wind slabs in isolated areas at upper elevations. Evaluate terrain features carefully and practice safe travel protocols. MODERATE avalanche danger exists at upper elevations today while LOW danger exists for lower and mid elevations. Sensitive wind slabs are the primary concern today, evaluate terrain features carefully and avoid areas with fresh wind deposit. With 6-12” of new low-density snow since Wednesday and moderate to strong winds, MODERATE avalanche danger will exist at mid and upper elevations due to WIND SLABS. LOOSE DRY sloughs will remain a concern for lower elevation steep sheltered terrain. The avalanche danger is MODERATE at Upper elevations today. LOW avalanche danger resides at mid to lower elevations. WIND SLAB and CORNICES are of most concern today. Human triggered avalanches are still possible; identify features of concern and adjust travel plans accordingly. High avalanche danger exists at all elevations today. Strong southwest winds and heavy snowfall will continue to make for hazardous conditions. Travel in or underneath avalanche terrain is not recommended. MODERATE avalanche danger exists due to fresh wind slabs developing from last night and today’s increasing SW winds. Human triggered avalanches will be possible. The avalanche danger is LOW at all elevations today. With continued warm temperatures be on the lookout for wet loose conditions in the mid to low elevations, particularly if the day turns out to be sunnier than forecasted. The avalanche danger is LOW at all elevations today. Be cognizant of residing warm temperatures and the potential for loose wet conditions in the mid to low elevations, especially if the day is sunnier than expected. The avalanche danger is MODERATE at all elevations today. Wind slab is the primary concern in the Upper Elevations. Warming temperatures may destabilize wind slabs and cause loose wet avalanches. Persistent slab avalanches remain a problem. The avalanche danger is CONSIDERABLE at all elevations today. High winds with 8-10” of new snow with addtitional accumulations throughout the day will form sensitive wind and storm slabs throughout the range. Persistent slab avalanches also remain an avalanche problem today. Moderate Avalanche danger will exist today near and above tree line. While wind slabs will be harder to trigger today, It will be possible to find sensitive wind slabs on W-NW-N-NE-E slopes in areas with topography that encourages drifting. Considerable avalanche danger will remain today at upper elevations on W-NW-N-NE-E aspects. 8-10”of snow fell yesterday accompanied by moderate to strong winds. Expect to find sensitive wind slabs on northerly aspects in areas where topography encourages drifting. Avalanches will be unlikely for Wednesday and Thursday, but not impossible. Isolated small wind slabs sensitive to a human trigger could linger in complex upper elevation SE-S-W-NW facing slopes. Beware of Early season obstacles, as well as firm conditions in exposed terrain. Avalanches will be unlikely today, but not impossible. Strong SW winds today could form very isolated small pockets of fresh wind slab that could be sensitive to a human trigger on mid to upper elevation SE-E-N-NW facing slopes. Early season obstacles exist! For Tuesday small human triggered wind slab avalanches may be possible in isolated areas on upper elevation slopes that face SE-E-N-NW. Wednesday: Strong 60mph west winds, shifting out of the north in the afternoon, will lead to small new wind slabs sensitive to human triggering at all elevations. Human triggering will be possible. Natural and human triggered avalanches large enough to be of concern are unlikely. However as E-SE-S-SW slopes warm from sunny skies and milder temperatures today, small loose wet activity is likely. While natural and human triggered avalanches are unlikely, it will not be impossible today for a person to trigger a small wind slab avalanche on the leeward side of upper ridgelines on W-N-E facing slopes. Early season obstacles exist! Human triggered avalanches will remain possible today thanks to several persistent weak layers buried in our snowpack. Colder, northerly slopes near and above treeline remain the areas of greatest concern. Below ~9,000’ coverage is still thin and avalanches are unlikely. The avalanche picture for Sunday and Monday is complex with cautious route-finding and conservative decision-making essential. As the danger increases Monday, travel in avalanche terrain will not be recommended. Primary avalanche problems for Thursday thru Friday will focus on Loose Wet avalanches and very isolated Wet Slabs. Primary avalanche problems for Thursday thru Friday will focus on Loose Wet avalanches and isolated Wind Slabs in the Mid to Upper elevations. Primary avalanche problems for Saturday thru Monday will focus on Loose Wet. Primary avalanche problem for Thursday thru Friday will focus on Loose Wet. Primary avalanche problems for Tuesday thru Wednesday will increasingly focus on Loose Wet while Wind Slabs concerns begin to subside. Primary avalanche problems for Saturday thru Monday will focus on Wind Slabs, Storm Slab, and Loose Wet avalanches. Primary avalanche problems for Thursday thru Friday will focus on Loose Wet avalanches and possible Wet Slabs. Primary avalanche problem for Saturday thru Monday will focus on Loose Wet avalanches. Primary avalanche problem for Wednesday thru Friday will focus on isolated Wind Slabs in the mid to upper elevations and Loose Wet avalanches in the mid to low elevations. Sunday: The primary avalanche problems are isolated Wind Slabs and possible Wet Loose avalanches. Saturday: The primary problems will be Wet Loose and isolated Wind Slabs avalanches. The primary avalanche concern for the forecast period will be Wind Slabs and Storm Slabs above ~7000’. The primary avalanche concern for Monday thru Tuesday will be: Wind Slab avalanches and isolated Storm Slab avalanches. The primary avalanche concern for Sunday will be small to large, Wind Slab avalanches (NW-N-NE-E-SE-S) and developing Storm Slab avalanches as snowfall accumulates through the day. A winter weather advisory is now in effect thru 10am Saturday morning. Starting on Monday, February 13th, we will be issuing five Avalanche Advisories per week! High wind warning in effect from 6am thru 4pm Thursday. Winter Storm Warning in effect from 4pm Thursday afternoon to 4am Saturday. Tuesday: Human triggered avalanches will be unlikely in most areas, but possible especially at high elevations over 11,000’ on NW-W-S-SE slopes just below ridgelines and in extreme terrain due to high elevation NE winds that have been transporting snow. Blizzard warning in effect until 10 am PST Wednesday...dangerous blizzard conditions due to heavy snow and strong winds will continue today through Wednesday morning. Periods of moderate to heavy snow will continue through Wednesday night.
! !THIS IS JUST A SAMPLE ADVISORY!! The avalanche danger is mostly Low but this morning but rises to MODERATE as snow heats up with sun and cloud cover adding additional energy from the greenhouse effect. The avalanche danger is generally LOW this morning and will rise to MODERATE on slopes steeper than 35 degrees during the day with intense solar heating of the snow. The avalanche danger is MODERATE on steep north and east facing slopes. Small human-triggered soft slabs, wind slabs and sluffing of the new snow are possible today in both exposed and sheltered steep terrain. Natural slides are unlikely. The avalanche danger is rated generally LOW for the Mammoth Basin and June Mountain areas. Intense sun and warm temperatures could produce wet loose snow avalanches today. The avalanche danger is HIGH this morning in the backcountry around June Mountain, the Mammoth Lakes Basin and Rock Creek. HIGH avalanche danger rating applies to the June Mountain backcountry and the Mammoth Lakes Basin. The avalanche danger is MODERATE on steep north to east facing slopes in alpine terrain in the Mammoth Basin. Human triggered avalanches are possible on slopes steeper than 35 degrees where weak facets and depth hoar dominate the lower half of the snowpack. There are no observations from the backcountry to justify continuing the CONSIDERABLE danger rating for another 24 hours or lowering the danger rating to MODERATE. The next avalanche advisory will be posted Wednesday morning. The avalanche danger this morning is MODERATE near treeline and above treeline on all north facing slopes above 9,000 ft 35 degrees and steeper. Wind slab, storm slab and deep persistent slab avalanches are all possible today. The avalanche danger is MODERATE on slopes steeper than 35 degrees and LOW on less steep slopes at middle and upper elevations in the Mammoth Lakes Basin. North facing slopes near tree line (subalpine terrain) are most suspect due to more widespread weak snow at the base of the snowpack. The avalanche danger rating is MODERATE. Human triggered avalanches are possible on steep mid and upper elevation north facing terrain in the Mammoth Lakes Basin. 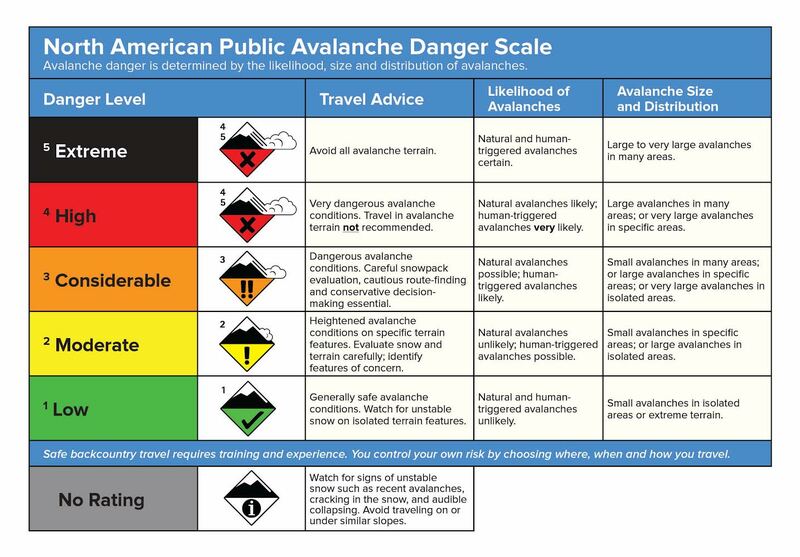 The avalanche danger rating is CONSIDERABLE. Human triggered avalanches are likely on steep mid and upper elevation north facing terrain in the Mammoth Lakes Basin. Dangerous avalanche conditions exist where newly formed wind drifts and slabs have formed. The first winter storm in almost 2 months will impact the area tonight and tomorrow. One to two feet of snow is expected to fall in the mountains abovoe 8,500 ft tonight and most of the day tomorrow. We are waiting for snow before advisories can be posted. See the update below. There is not enough snow cover to issue avalanche advisories. Read the discussion for updated information and pictures. We will begin issuing avalanche advisories and danger when there is enough snow. For an updated snowpack discussion, please read the discussion section. The dry weather continues. There is not enough snow to warrant avalanche danger ratings. Once snow comes, advisories will resume. For updated snowpack conditions, see the text discussion. We are waiting for snow. There is not enough snow to warrant regional danger ratings. For an update on snowpack conditions, see the text discussion. There is not enough snow to issue advisories at this time. Read on to learn about snowpack conditions in our area. There is not enough snow cover to issue avalanche advisories. A snowpack discussion is available as a text discussion. We are still without sufficient snowcover to warrant daily avalanche advisories.Snowpack observations have begun and read the Recent observations for more information. Daily avalanche advisories will begin as soon as conditions warrant. We are still without sufficient snow cover to warrant daily avalanche advisories. I am making snowpack observations and posting them to the observations section. There is not enough snow for recreating in the backcountry, therefore there is no avalanche danger rating.